If you’re ready to try new tactics to help you increase the number of leads you collect, the holiday season is a great time to do it. ShortStack.com recently ran a study of more than 360,000 marketing campaigns and learned that more leads are collected during the month of November than any other time of year. In fact, ShortStack.com users, on average, see a 73% increase in lead generation during the holiday months (September to December). Collecting lots of leads during the holidays gives you a solid list to nurture and market to during the rest of the year (we’ve got plenty of ideas for ways to do that, too). That’s exactly why Advanced Micro Devices (AMD), a semiconductor company that develops computer processors and related technologies for business and consumer markets, decided to run a 45-day promotion during the holidays. 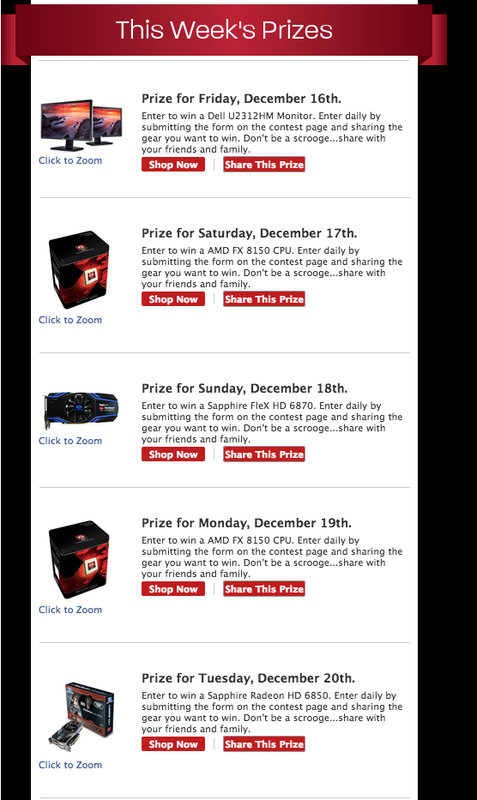 In this case study, we’ll show you how AMD worked with ShortStack.com to build and execute a holiday promotion that resulted in 98,000 entries, 207,000 contest campaign views, and 86,000 shares on Facebook. Here’s how AMD accomplished their goals and how you can apply these tips to your own campaigns. Setting defined goals is one key to running a successful Campaign. Decide: What are the top one or two things (three at the most) you want to achieve? AMD’s goals for their promotion were to drive brand awareness and to find new brand advocates. However, they also had an overall business objective that they wanted to incorporate into their Campaign. During this time, one objective was to reach out to a larger segment audience, a more general consumer who was not necessarily familiar with processors and the difference between AMD and other processors such as Intel. In order to accomplish their goals, AMD had two different ad creatives they targeted to the respective audiences. They also offered a variety of prizes that were attractive to more computer-processing savvy consumers mixed with general prizes that would interest their broader audience. While your business may have a specific kind of audience, not every promotion you run will have the same target audience. AMD targeted most of their promotions to the people who made up the majority of their social followers and fans. That audience consisted of enthusiasts, do-it-yourself guys and devoted gamers. AMD referred to them as the “Enthusiast” audience. 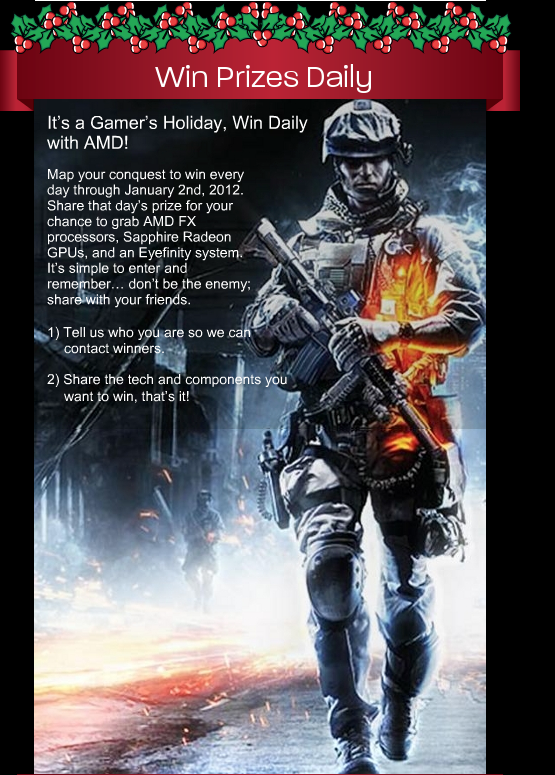 However, as we previously mentioned, AMD was looking to target an additional audience for this holiday promotion. They set their sights on a new “Consumer” audience which consisted of tech-oriented women. Specifically, women in the home who had become tech buyers. As AMD learned, the holidays are a great time to expand a target audience since people are actively looking for special promotions and great deals because they’re conscious about their spending. AMD has known for quite some time that the holidays are a valuable time for promotion; the year before the effort discussed here, they had run a successful Twitter campaign during Cyber Monday week. The next holiday season they wanted to take the elements from that Campaign and re-purpose the contest for a different platform. In this case they wanted to target their audience on Facebook. They also wanted to extend the promotion to last for more than one week and, ideally, go beyond the holidays. They brainstormed with their marketing agency, Social Media 180, and decided to run a 45-day promotion where they gave away two different prizes, every day for the entire 45-day period. There were several things that AMD knew they wanted their fans to do when they landed on their Campaign. For one, they wanted to get them to keep coming back and engage with them, daily, for the entire 45-day period. Second, they wanted people to share the prizes that they hoped to win with their friends and family. They succeeded because they had highly targeted and sought-after prizes. By having strict goals and strategies, AMD was able to reach and exceed their Campaign expectations. During this promotion, AMD received more than 98,000 entries, 207,000 app views on the contest app, and 86,000 shares on Facebook. They received more than 20,000 new fans over the 45-day period.